NANS leader, undergraduates arrested for murder, robbery – Royal Times of Nigeria. 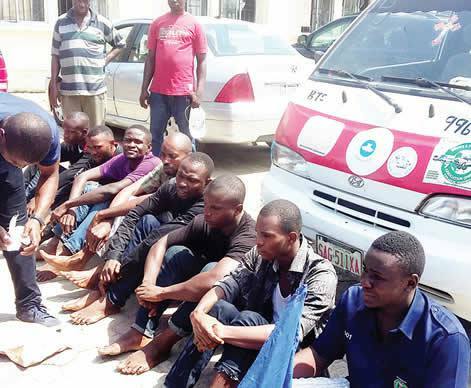 A leader of the National Association of Nigerian Students, Bayelsa State chapter, and seven other undergraduates have been arrested by the police in connection with the alleged killing of a student. According to the information gathered from Amba, The incident occurred at the Zone B Election for Coordinators of NANS at the Federal University, Otuoke, Bayelsa State, between November 25 and November 26. He explained further that Ayo Kehinde, Jamiu Salahudeen and Nwanya Chinonso – reported to the police that the suspects (students) hijacked their vehicles and robbed them at gunpoint. He also said that, the police has recovered arms and ammunition from the suspects, including two locally-made single-barrelled pistol; two live ammunition; five 9mm live ammunition and some charms.